Gone are the days when dealers would soap up their showroom windows hoping to build anticipation for the new model year. That said, there are still plenty of reasons to get excited about the 2014 lineup. It’s not easy being a carmaker these days; the competition is fiercer than ever. But that’s good news for car buyers, who have more selections to choose from than ever before. If anything, manufacturers are filling in all those gaps between traditional model segments with creative new offerings that are likely to be exactly what you’re looking for. Styling is a critical differentiator in today’s market, and one could argue that we’ve entered the golden era of design. Manufacturers are doing more than just bending sheet metal into new and appealing shapes; they’re delivering a seemingly counterintuitive mix of improved fuel economy, remarkable performance, and slashed emissions. The credit goes to breakthroughs in technology — both mechanical and electronic. 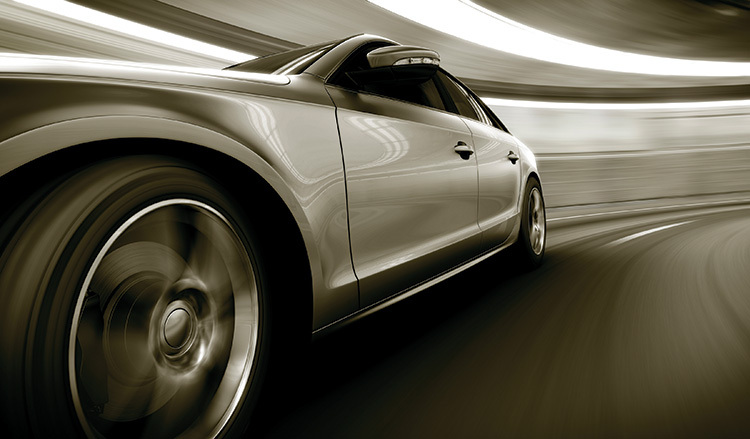 Indeed, today’s luxury cars often boast more microprocessing power than the typical home. That translates into advanced infotainment systems that are smarter than the latest smartphones, as well as breakthrough safety features that not only reduce the likelihood of injury in a crash but can help you avoid a collision in the first place. 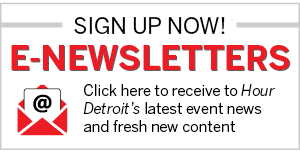 Want more good reasons to get excited about the 2014 model year? Here are some of our favorite products, now rolling into your local showrooms. We’ve been fans of the Lexus IS line since its 2000 model year debut; the sedan delivers a surprising amount of value and visual appeal at an affordable price. But the all-new 2014 remake has bumped up the fun factor by a solid order of magnitude while also improving the IS sedan’s looks, both inside and out. The new design, starting with the distinctive Lexus “spindle grille,” was directly influenced by the LFA supercar, giving the 2014 IS a more sporty and aggressive — yet refined — appearance that carries over into the new cockpit-style interior. Passengers will immediately appreciate the use of upgraded materials, more comfortable seats, and the added room that comes from stretching the sedan’s wheelbase by nearly three inches. For the driver, the new IS features gauges and controls that are easier to read and reach, but the real thrill starts the moment the car is fired up. The 2014 model offers two different engine choices: a fuel-efficient, 204-horsepower V-6; or the more sporty 306-hp, 3.5-liter V-6. In rear-drive configuration, they’re paired to a silky-smooth 8-speed automatic. For more temperate climes, buyers have the option of a 6-speed automatic coupled with traction-enhancing all-wheel-drive. The new sport-tuned suspension found on both V-6 models is still able to make even the worst road bumps all but vanish, but the IS 350’s new Adaptive Variable Suspension takes things a step further by delivering the sort of on-rails feeling through tight corners you’d expect from a true sports sedan. 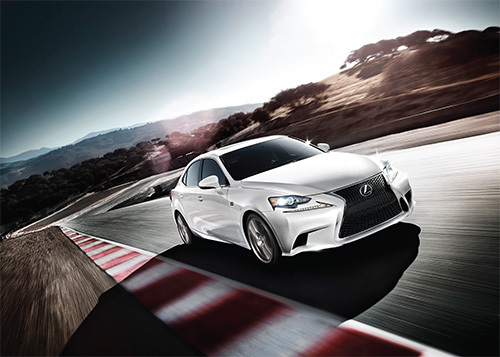 We’ve always appreciated the Lexus IS, but the new 2014 update is everything we’ve come to expect — and a lot more. When it set out to design a replacement for its midsize MKZ, Lincoln knew it needed to break with the past — and nothing makes that more clear than the distinctive redesign of the Detroit carmaker’s classic waterfall grille, which has been transformed to look more like the outstretched wings of an eagle, says designer Max Woolf. Another eye-catching feature is the industry-first, all-glass retractable roof. From top to bottom and stem to stern, the new Lincoln MKZ is a visual standout that rises out of an otherwise crowded midsize luxury market. Be sure to check out the sedan’s striking interior. With its elegant, high-gloss finish, the center stack wraps around a large touchscreen that operates key vehicle functions — although Ford engineers and designers struck a careful balance to ensure the buttons and switches a driver frequently accesses are on the display’s surround so you don’t have to wade through distracting menus to, for example, adjust the interior temperature. The new Lincoln MKZ comes with a choice of two desirable engine options. There’s the high-mileage, 2.0-liter Ford EcoBoost inline-four, as well as a hybrid-electric alternative that will deliver 45 mpg. That’s the sort of number you once could only expect from a little econobox, not from a stylish and roomy midsize luxury sedan. Better yet, Lincoln offers the hybrid package for the same price as the still quite efficient EcoBoost I-4. 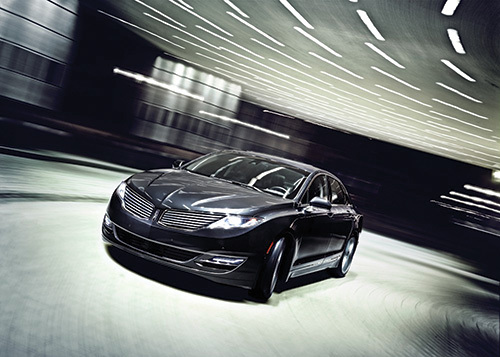 The MKZ is the first in a wave of new products billed as the reinvention of the Lincoln brand. If this is where it all begins, we expect buyers will be keeping a close eye on the Lincoln lineup in the years to come. The pleasure and thrill of pure luxury can now be enjoyed every day, with the new Maserati Ghibli — a unique combination of style, sporty handling, and comfort that’s designed to make driving a special car an everyday sensation. Maserati Ghibli touches all the senses. It blends Italian style, exclusivity, and perfect proportions with a luxurious interior that pushes the boundaries of comfort and spaciousness. The soft leather upholstery, exquisite stitching, and smooth lines of the dashboard create an ambience of unique luxury. The large 8.4-inch Maserati touch control display provides user-friendly control of most of the on-board devices, while the car’s driver-oriented settings are controlled by a cluster of push buttons on the central tunnel, beside the gear lever. 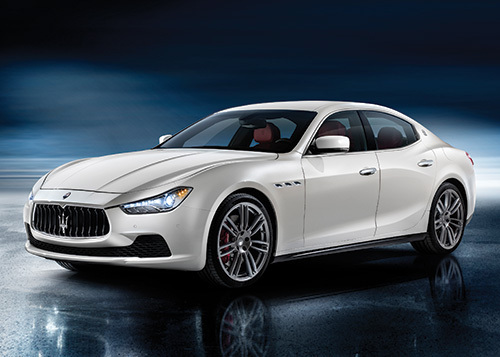 The Maserati Ghibli, starting at $65,600 and Maserati Ghibli S Q4, starting at $75,700, are driven by innovative 3.0-liter twin-turbo V6 engines with a sporty soul and unmistakable sound. The rear-wheel-drive Maserati Ghibli pumps out 345 HP, while the all-wheel-drive Maserati Ghibli S Q4 pumps out 404 HP. The best news is that now you can experience this for yourself! Come in to Maserati of Troy, located in the Troy Motor Mall, and test drive a Maserati Ghibli or Ghibli S Q4. And just for taking a test drive, you’ll receive a free gift! Volvos have long had a reputation for being some of the safest cars on the highway, and the S60 won’t let Volvo fans down; it’s equipped with some of the most advanced safety features available on the market. While that may be a critical factor for many motorists, the S60 gives potential buyers plenty of other reasons to head to the nearest Volvo showroom. For those who haven’t kept a close eye on the Volvo line lately, you could be in for a pleasant surprise. Gone are the solid but staid and boxy designs of decades past. 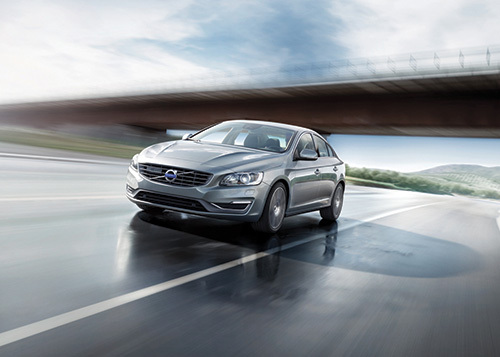 The new S60 is a handsomely sculpted sedan in keeping with the modern definition of Scandinavian design. The interior is tastefully and elegantly executed, with comfortable leather seats and real metal accents. And, as you might suspect, Volvo engineers have put a premium on the ergonomic layout of the S60’s gauges, buttons, and navigation screen. The powertrain is offered in three flavors: the T5’s inline-five-cylinder, making a more-than-adequate 250 horsepower; the peppy T6, making 300 hp; and, for serious enthusiasts, the 325 hp T6 R Design. Both versions of the T6 offer lower, performance suspensions. Even the “base” car has a comfortable — yet sporty — feel on the road. And, as we suggested, the S6 doesn’t let you down when it comes to safety. Among its many features, the City Safety system helps spot obstacles and can even apply the brakes if the driver is distracted. That’s one reason the IIHS named the S60 a Top Safety Pick +, something that might also earn you a nice discount on your insurance premiums. 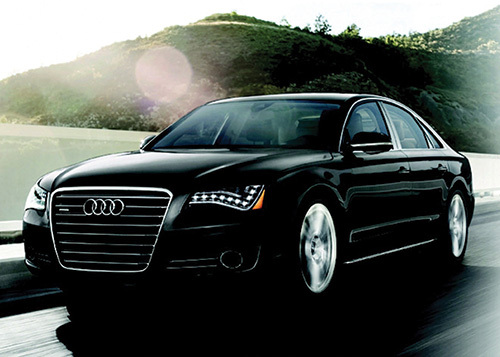 The result of uncompromised design, the 2014 Audi A8 is the zenith of Audi engineering; its wide stance and sporty lines hold a finely-tuned Audi quattro® all-wheel drive system. With iconic LED lighting, advanced technologies including the Audi MMI® touch, and an exquisite interior, the A8 has a fit and finish that’s unequaled in the industry. It’s so seductive and stylish, the word “sedan” seems a bit small. Instead, the Audi A8 L TDI® clean diesel sedan should be described in somewhat bolder terms: Spectacular, perhaps? Stately? Stunning? The A8 L, of course, is still the executive’s choice, the pinnacle of the automaker’s craft, a statement of cultivated tastes and well-defined performance — as well as a vehicle that provides better mileage than hybrids in the same segment.